Mark Antony could have been talking about Mary Boleyn, the older sister of Henry VIII' s ill-fated second wife, Anne, who failed to provide Henry with a male heir, instead giving birth to the future Queen Elizabeth I. In her forensic biography "Mary Boleyn: The Mistress of Kings" (Ballantine Books, 400 pages, 16 page color photograph insert, bibliography, index, $28.00) Weir provides a fresh look at a much maligned woman. Tudor junkies who read "Mary Boleyn" can get their fix with the most logical scenarios of a woman whose reputation has been tarnished -- to say the least -- by romantic fiction, TV shows and movies, garbled gossip and misconceptions and untruths repeated down through the centuries by historians and others. 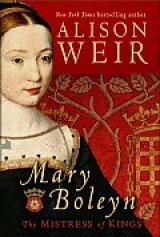 I've reviewed two books by English historian -- and novelist -- Weir: "The Lady in the Tower", a detailed 2010 examination of the trial of Anne Boleyn, Henry VIII's second wife (link to my review: www.huntingtonnews.net/.../100106-kinchen-columnsbookreview.ht) and a 2009 biography of Katherine Swynford, mistress and later wife of John of Gaunt "Mistress of the Monarchy" (my review: www.huntingtonnews.net/.../090204-kinchen-columnsbookreview.ht). I tell myself and everyone who asks me why I'm so interested in the Tudors that no, I'm not a Tudor junkie, but maybe I am! The era to me is like a chain reaction highway pileup, with people in high places behaving badly, murderously. The gap between the wealthy and the rest of the people was even wider than it is today. Bad behavior is endemic and continues today with the actions of politicians and the CEOs of corporations and investment banks on Wall Street, who behave like kings -- proving that the more things change the more they stay the same. By reading about the Tudors we can understand bad behavior -- even evil -- today. Using the same kind of extensive forensic research she employed with great effect in "The Lady in the Tower" to show how and why Anne Boleyn was falsely condemned to death -- with the participation on the jury of her father Sir Thomas Boleyn -- Weir presents in "Mary Boleyn" a rebooted portrayal of her subjects, showing how Mary was treated by her ambitious family and the complicated nature of Mary and Anne Boleyn. She also presents new evidence restoring the reputation of Mary’s mother, Elizabeth Howard, who was falsely rumored to have been an early mistress of Henry VIII. There's no doubt that Mary Boleyn was first a mistress of the French king François I, while she was at the French court as lady in waiting to Henry VIII's sister Mary Tudor, who was married to Louis XII. There's no doubt that Mary Boleyn was also a mistress of Henry VIII while she was married to her first husband William Carey -- and that Henry VIII was most likely the father of her daughter Katherine. All this sounds like enough to blacken Mary Boleyn's reputation, but Weir says it's not enough to justify calling her a "great and infamous whore" -- one of many epithets attached to The Other Boleyn Girl. Her marriage to Carey was a love match, unusual and even frowned upon in the Tudor era, but Carey was, in Weir's estimation, a handsome young man who was Henry VIII's cousin and a rising star in his court. He wasn't the nonentity that historians have called him. After Carey died in 1528 of the mysterious plague "the sweating sickness" that afflicted England and consumed many people -- including Henry VIII -- with terror, Mary Carey lived in a kind of limbo, which continued even after she met and married a soldier named William Stafford, much younger than Mary. It was another love match and Mary's failure to get her sister's permission to wed further estranged the sisters and, for that matter, the entire Boleyn family. Stafford outlived Mary, who died in 1543, probably at the age of 43 or 44. The exact birth dates of Mary and Anne are not known, as Weir explains in detail, but there is no doubt that Mary was a few years old than Anne. Alison Weir is the New York Times bestselling author of many historical biographies, including The Lady in the Tower, Mistress of the Monarchy, Henry VIII, Eleanor of Aquitaine, The Life of Elizabeth I, and The Six Wives of Henry VIII, and of the novels Captive Queen, Innocent Traitor, and The Lady Elizabeth. She lives in Surrey, England, with her husband. Her websites: www.alisonweir.org.uk and www.alisonweirtours.com.